-6 color coded ck mats- The mat is left whole while the other part is cut into pieces and stored in a baggie. Students take the pieces and read the word. They find the matching picture on the mat and place the word on top of it. You can also take both the picture cards and word cards as a memory game. 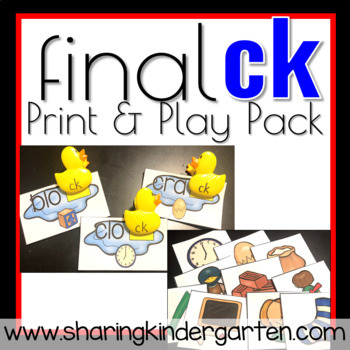 -3 coordinating and differentiated record sheets for writing ck words. You can also use this as a separate activity. -4 differentiated letter writing mats for ABC practice. -ck reader- 2 differentiated versions: one your students cut out and glue down the whole word while the other version your students cut out and glue down just the ck letters. You can also use this for students to write in the letters to form words.